« How Reliable is Your Current Data Backup Strategy? Mar 13, 2004 — The MCA-I New York chapter got to taste a little fame by proxy last month when Ferry Tales, a short form documentary co-produced by chapter president Corinna Sager, was nominated for an Academy Award®. The film, which takes a wry look at the relationships that develop among women commuters who meet and interact in the Staten Island Ferry powder room each morning, was one of three finalists for the coveted award. Neither Sager nor the MCA-I NY board of directors could have guessed two-plus years ago when we launched the festival to showcase nominated short form documentaries, that the following year we would be screening one produced by a chapter member, or that the festival itself would pick up such momentum in its second year. A week before Oscar® night, The 2nd Annual Underdog Film Festival opened at Anthology Film Archive in Manhattan’s East Village. Co-produced by MCA-I NY and its intrepid film critic, Lisa Yapp, the two-day festival brought out nearly three hundred film fans and reporters. When the doors opened on day one, a line of ticket buyers was stretched halfway down the block and camera crews were jostling for position to cover the event and interview the filmmakers. The films were wonderful. We were able to present all three short form nominees this year plus two last-minute additions from other nominated categories. Asylum (dir. Sandy McLeod and Gini Reticker), Chernobyl Heart (dir. Mary Ann DeLeo), and Ferry Tales (dir. 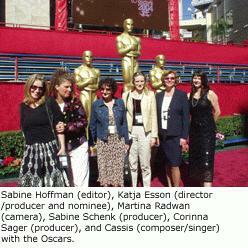 Katja Esson), were screened, along with The Red Jacket (dir. Florian Baxmeyer), nominated for best short live-action film, and Nibbles (dir. Chris Hinton), a nominated animated short. There was networking and refreshments before the screenings and a panel discussion with the filmmakers after. An audience’s choice award, The Dish, introduced this year, was won by Ferry Tales. In the end, Chernobyl Heart, a devastating film about the effects of radioactive fallout on the children of Chernobyl, took home the Oscar. As for the runners up, if you visit our Photo Gallery, you will be able to see that it was nearly as sweet to have reached that most rarified level of achievement, an Oscar nomination, as to have won. For this year’s Oscar results, go to the Winners List page on the Oscar Web site.